Doctor Who Magazine (abbreviated as DWM) is a magazine devoted to the long-running British science fiction television series Doctor Who. Its current editor is Marcus Hearn, who took over from the magazine’s longest-serving editor, Tom Spilsbury, in July 2017. It is currently recognised by Guinness World Records as the longest running TV tie-in magazine. Officially licensed by the BBC, the magazine began life as Doctor Who Weekly in 1979, published by the UK arm of Marvel Comics. The first issue was released on Thursday 11 October with a cover date of 17 October and priced 12p. The magazine moved from weekly to monthly publication with issue 44 in September 1980, becoming Doctor Who Monthly with a cover price of 30p. Styled on the cover as ‘Doctor Who – A Marvel Monthly’ the tagline was not part of the name, but simply a descriptor which appeared on many of Marvel UK’s monthly titles at that point. 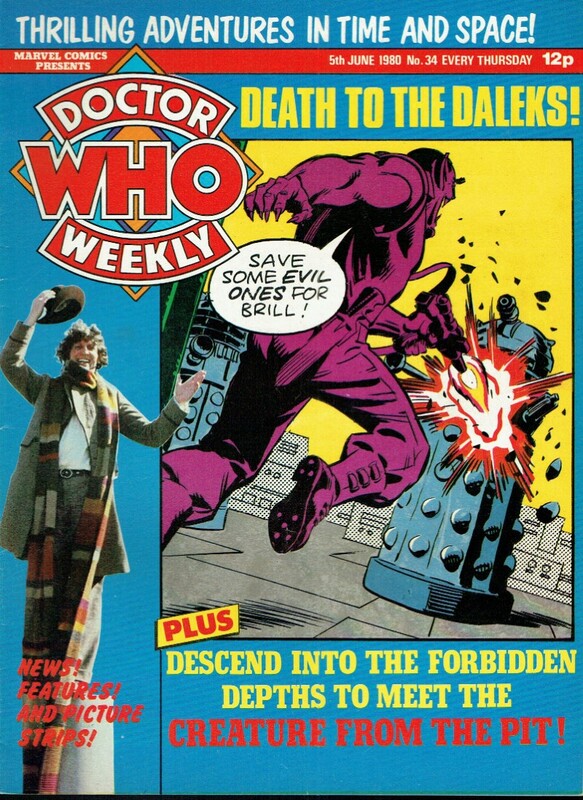 The copyright notice continued describing the publication as ‘Doctor Who Weekly’ until issue 48. The cover title changed to Doctor Who Monthly with issue 61. The title changed to The Official Doctor Who Magazine with issue 85 in February 1984. It became The Doctor Who Magazine with issue 99 in April 1985, and simply Doctor Who Magazine with issue 107 in December 1985. The magazine has remained under that title ever since, although an exception was made for issue 397 in June 2008 when the cover only featured the words Bad Wolf following transmission of the Doctor Who episode “Turn Left” on Saturday 21 June. In 1990 the magazine started appearing once every four weeks (13 times a year). Despite the BBC discontinuing production of Doctor Who in 1989, the magazine continued to be published, providing new adventures in the form of comics. The television programme was revived in 2005, providing a new generation of fans which the magazine was seeking to attract. Originally geared towards children, DWM has grown into a more mature magazine exploring the behind-the-scenes aspects of the series.Due to its longevity, it is seen as a source of ‘official’ and exclusive information, sharing a close relationship with the television production team and the BBC. In 2006, however, it lost its exclusivity when BBC Worldwide launched its own comic, Doctor Who Adventures, aimed at a younger audience. DWM is now published by Panini Comics, which purchased the title along with the rest of the Marvel UK catalogue in 1995. Panini has begun to digitally restore and reprint older DWM comics in trade paperback format. Twenty-five volumes have been printed so far: two featuring the comics adventures of the Fourth Doctor, one with the adventures of the Fifth Doctor, two featuring the Sixth Doctor, five with the adventures of the Seventh Doctor, four focusing on the Eighth Doctor, one with the adventures of the Ninth Doctor, three featuring the Tenth Doctor, four collecting the adventures of the Eleventh Doctor and three with the adventures of the Twelfth Doctor. Panini also published a one-shot magazine-format reprinting of the complete Ninth Doctor strips in 2006 and most of the Tenth Doctor and Martha Jones strips in 2008. DWM issue 426 reported that the series had been postponed; it eventually resumed with the publication of “The Crimson Hand” in May 2012. DWM’s 400th issue was published in September 2008, and the publication celebrated its 30th anniversary in October 2009. In April 2010, it was confirmed in issue 420 that Doctor Who Magazine now holds the Guinness World Record for “Longest Running Magazine Based on a Television Series.” The magazine reached its 500th issue in May 2016. In April 2011, Panini Comics released a new monthly magazine titled Doctor Who Insider; although it was made in Britain the magazine was published for North America. It was announced on 27 January 2012 that Doctor Who Insider had ceased publication after nine issues. Doctor Who Insider returned for a special edition issue in 1 November 2012.